Objective: The objective of this study was to investigate the pharmacokinetic properties of insulin degludec in healthy Chinese subjects and to compare those properties with results from previous trials in Caucasian and Japanese subjects. Methods: Twenty-four healthy Chinese subjects received a single dose of 0.4 U/kg body weight insulin degludec. Blood samples were taken for pharmacokinetic analysis pre-dose and until 120 hours post-dose. A population pharmacokinetic model was applied to the single-dose data to simulate steady-state profiles. Results: Compared with the observed single-dose 24-hour serum insulin degludec profile, corresponding to the first dosing interval in a once-daily regimen, the simulated steady-state serum insulin degludec concentration was higher. This was expected since steady-state for insulin degludec is reached after 2-3 days of once-daily dosing due to its long half-life. The simulated steady-state pharmacokinetic profile of insulin degludec in healthy Chinese subjects showed a close to even distribution of exposure across a 24-hour dosing interval, comparable to that in healthy Caucasian subjects and in Caucasian and Japanese subjects with type 1 diabetes. Steady-state total exposure and maximum concentration of insulin degludec were within the same range in Chinese subjects compared with Caucasian and Japanese subjects. Conclusion: The pharmacokinetic properties of insulin degludec in Chinese subjects are consistent with those in Caucasian and Japanese subjects. ClinicalTrials.gov identifier: NCT01437592. Approximately 415 million people worldwide live with type 1 or type 2 diabetes, and it is anticipated that this number will rise to 642 million by 2040 . In China, where this trial was conducted, the prevalence of total diabetes was 10.9% in 2013, which corresponds to about 119 million Chinese adults with the disease . While patients with type 1 diabetes mellitus (T1DM) require treatment with insulin from the onset of disease, most of those with type 2 diabetes mellitus (T2DM) also eventually need treatment with insulin, alone or in combination with oral antidiabetic drugs or glucagon-like peptide-1 receptor agonists . The ideal basal insulin should mirror the physiologic basal insulin secretion without any periods of substantial peak levels. Current basal insulin analogs, including once-daily insulin glargine (at 100 U/mL and 300 U/mL) and once- or twice-daily insulin detemir, have advantages over neutral protamine Hagedorn insulin both in terms of their longer duration of action and a reduced peak effect . However, they do not provide full 24-hour blood glucose control in all patients, as duration of action may vary between individuals. Consequently, some patients require twice-daily dosing . Moreover, the glucoselowering profiles of basal insulin analogs currently available are not equally distributed across the dosing interval, which would be the goal in order to optimally control blood glucose in the fasting state . Rather, they are characterized by periods of low action increasing to a peak or plateau subsequently followed by a decline [4,5]. Therefore, new basal insulin analogs with further optimized pharmacological properties, including prolonged and consistent effect, are needed. Insulin degludec is a new-generation basal insulin that has been developed for oncedaily administration [6,7]. Upon subcutaneous injection, soluble multi-hexamers of insulin degludec are formed in the subcutaneous tissue, from which monomers slowly and gradually separate and become absorbed into the circulation . The half-life of insulin degludec is thus approximately 25 hours, twice as long as that of insulin glargine, which provides a long duration of action extending beyond 42 hours in Caucasian subjects [9,10]. In addition, the pharmacokinetic and pharmacodynamic profiles of insulin degludec are distributed evenly over a 24-hour dosing interval in Caucasian and Japanese subjects, and insulin degludec has a lower day-to-day and within-day variability than insulin glargine 100 U/mL and 300 U/mL and a more stable glucose-lowering effect [10-14]. Pharmacological properties of exogenous insulin may be affected by several intrinsic factors including race and ethnicity [15,16], which could potentially affect the dosing recommendations for a specific population. Until now, the pharmacokinetic properties of insulin degludec in Chinese subjects have not been investigated. The aim of the current study was therefore to investigate and characterize the pharmacokinetic properties of insulin degludec in healthy Chinese subjects in order compare with results from previous clinical pharmacology trials. We thus made a post hoc comparison of the pharmacokinetic results with those observed previously in Caucasian and Japanese subjects from previous trials with insulin degludec which used similar overall pharmacokinetic methodology. Before starting, the trial was approved by the Chinese health authority, China Food and Drug Administration (CFDA), and by the Peking Union Medical College Hospital ethics committee, Beijing, China. The trial was conducted in agreement with the Declaration of Helsinki and any amendments in force at trial initiation . Before the start of any trial-related activities, all subjects provided their consent to participate in writing. This was a single-center (Clinical Pharmacology Research Center, Peking Union Medical College Hospital, Beijing, China), open-label, single-dose trial conducted in healthy Chinese subjects (ClinicalTrials.gov identifier: NCT01437592). Eligible participants were healthy Chinese male and female subjects aged 18-45 years (inclusive), with a body mass index (BMI) of 19.0-24.0 kg/m2 (inclusive), and a fasting plasma glucose ≤ 6.0 mmol/L (≤ 108 mg/dL). Subjects were excluded if they had used the following medications in the 3 weeks before screening: prescription or non-prescription drugs (including over the counter medication, or non-routine vitamins and herbal products). Also excluded were pregnant or breastfeeding women. The trial included a screening visit, a dosing visit (2-14 days after the screening visit) and a follow-up visit (7-21 days after the dosing visit). At the dosing visit, subjects attended the clinic the evening before dosing. The next morning, a single dose of 0.4 U/kg body weight insulin degludec (100 U/mL, 3 mL FlexTouch®, Novo Nordisk A/S, Bagsværd, Denmark) was administered as a subcutaneous injection into a lifted skinfold on the anterior surface of the thigh. The subjects stayed in the clinic for 48 hours after dosing, during which blood samples were taken for pharmacokinetic analysis (predose, 30 min, 1 h, 2 h, 4 h, 6 h, then every hour until 20 h, 22 h, 24 h, 30 h, 36 h, 48 h) and for monitoring of blood glucose concentration (predose, every 30 min until 20 h, 22 h, 24 h, 30 h, 36 h, 48 h). Subjects were offered standard meals regularly. After discharge from the clinic at 48 hours after dosing, subjects returned to the clinic at 72, 96 and 120 hours post-dosing for blood sampling for pharmacokinetic and blood glucose assessment. Serum concentrations of insulin degludec were assessed using a validated insulin degludec specific sandwich enzyme-linked immunosorbent assay . Most insulin degludec in the circulation is bound to albumin, while only a minor fraction is freely circulating . It should be noted that the insulin degludec assay detects the total insulin degludec concentration, that is, the sum of the free fraction and the albumin-bound fraction. Pharmacokinetic endpoints included the area under the insulin degludec serum concentrationtime curve from 0 to 120 hours after a single dose (AUC0-120h,SD), maximum observed insulin degludec serum concentration after a single dose (Cmax,SD) and time to maximum observed insulin degludec serum concentration after a single dose (tmax,SD). AUC0-120h,SD was derived using the linear trapezoidal technique based on observed values and actual measurement times between 0 and 120 hours with missing values interpolated. Cmax,SD and tmax,SD were derived from the individual concentration-time curves. Safety endpoints included adverse events, including injection site reactions, laboratory safety assessments, vital signs, physical examination, and electrocardiogram. Hypoglycemic episodes were also assessed and defined as ‘confirmed’ if they were either ‘severe’ according to American Diabetes Association criteria and required third party assistance , or verified by a plasma glucose level of below 3.1 mmol/L [<56 mg/dL]). Pharmacokinetic endpoints and safety endpoints were assessed for all subjects who received a single dose of insulin degludec and were summarized using descriptive statistics. Statistical analyses were performed using Statistical Analysis System (SAS) version 9.1.3 (SAS Institute Inc., Cary, North Carolina, USA). In this single-dose study, a population pharmacokinetic model was applied to simulate steady-state pharmacokinetic profiles of insulin degludec. The model included an absorption part with a depot compartment, a transit compartment, an absorption rate parameter and a transit rate parameter. In addition, a disposition part with one compartment, a clearance parameter and a volume of distribution parameter were included. The model parameters were estimated in a population setting using a non-linear mixedeffects method. This allowed individual sets of the four parameters to be acquired for each subject included in the trial. The absorption rate parameter values for insulin degludec were then calibrated using additional information from the extensive clinical pharmacology program with insulin degludec (the same calibration factor was used for all subjects). Utilizing the individual parameters, simulation of once-daily insulin degludec dosing was performed multiple times in order to obtain the mean steady-state insulin degludec profile. Specifically, once-daily dosing for 6 days at a dose level of 0.4 U/kg/day was simulated multiple times by extrapolating the profile for each subject and calculating the mean of the profiles on Day 6. Furthermore, in order to determine the ability of the pharmacokinetic model to predict the observed data after a single dose, the mean of the model-based profiles on Day 1 was also calculated and plotted on top of the observed single dose data. The modelling was performed using NONMEM® version 7.1.2 (ICON Development Solutions, Ellicott City, MD, USA). Total exposure during one 24- hour dosing interval at steady state (AUCτ,SS) and exposure from 0 to 12 hours after dosing at steady state (AUC0-12h,SS) were derived by noncompartmental analysis, and the ratio between AUC0-12h,SS and AUCτ,SS was calculated for each subject. Maximum concentration of insulin degludec at steady state (Cmax,SS) and time to maximum concentration of insulin degludec at steady state (tmax,SS) were derived from the individual concentration-time curves. In order to relate the pharmacokinetic properties of insulin degludec in Chinese subjects to those seen in other populations, comparison was made between the current study results and results in Caucasian and Japanese subjects obtained from other trials within the insulin degludec clinical pharmacology program. The simulated steady-state pharmacokinetic profile and derived pharmacokinetic parameters from the present study in healthy Chinese subjects were compared with those in healthy Caucasian subjects (simulation-based data) , Caucasian subjects with T1DM (observed data)  and Japanese subjects with T1DM (observed data) . All four trials were comparable with respect to overall pharmacokinetic methodology (e.g. blood sampling procedure, handling and serum insulin degludec analysis). A total of 69 subjects were screened, and 24 healthy Chinese subjects were exposed to a single dose of insulin degludec and completed the trial. Subject characteristics for the 24 subjects are presented in TABLE 1. Table 1: Phytochemical screening of leaves extract of Martynia annua Linn. After a single dose of 0.4 U/kg insulin degludec in 24 healthy Chinese subjects, the geometric mean insulin AUC0-120h,SD was 78192 (coefficient of variation (CV) 11%) pmol∙h/L and the geometric mean Cmax,SD was 3489 (CV 26%) pmol/L. The median (range) tmax,SD was 11.0 (4.0-15.0) hours. FIGURE 1 (dashed grey line) shows the observed single-dose 24-hour mean serum insulin degludec profile in healthy Chinese subjects, which also corresponds to the first dosing interval in a once-daily dosing regimen. Single-dose data from the present trial were used to simulate the steady-state pharmacokinetic profile of insulin degludec in healthy Chinese subjects applying a population pharmacokinetic model. As can be seen in FIGURE 1, the model -based single-dose profile (dotted blue line) was similar to the observed profile (dashed grey line), thus the pharmacokinetic model predicted the observed single-dose data well. Moreover, as expected due to the long half-life of insulin degludec, the simulated steady-state serum insulin degludec concentrations (FIGURE 1, solid blue line) were higher than those observed after single dose, and the simulated steady-state serum insulin degludec profile showed a close to even distribution of insulin degludec exposure across a 24-hour dosing interval. The simulated steady-state pharmacokinetic profile of insulin degludec in healthy Chinese subjects was comparable to that obtained in previous studies in healthy Caucasian subjects (simulation-based), Caucasian subjects with T1DM (observed data) and Japanese subjects with T1DM (observed data) (FIGURE 2). Total exposure (AUCτ,SS) and maximum concentration (Cmax,SS) of insulin degludec at steady state were both within the same range in the four groups (TABLE 2), as was median time to maximum concentration of insulin degludec (tmax,SS; 9.5, 10.5, 9.0 and 8.0 hours in healthy Chinese, healthy Caucasian, Caucasian with T1DM and Japanese with T1DM). This further supports comparable pharmacokinetic properties of insulin degludec across these four groups. The ratio between AUC0-12h,SS and AUCτ,SS was close to 50% in the current study in Chinese subjects as previously shown in Caucasian and Japanese subjects (TABLE 2). Thus, irrespective of race or nationality, exposure of insulin degludec was evenly distributed across the first and second half of the 24-hour dosing interval at steady state. Figure 1. Mean 24-hour pharmacokinetic profiles after a single dose of 0.4 U/kg insulin degludec (observed as well as model-based) and at steady state after once daily dosing of 0.4 U/kg insulin degludec (simulationbased) in healthy Chinese subjects. The similarity of the model based single-dose profile and the observed single-dose profile shows that the population pharmacokinetic model predicted the observed single-dose data well. SD: single dose; SS: steady state. Figure 2. 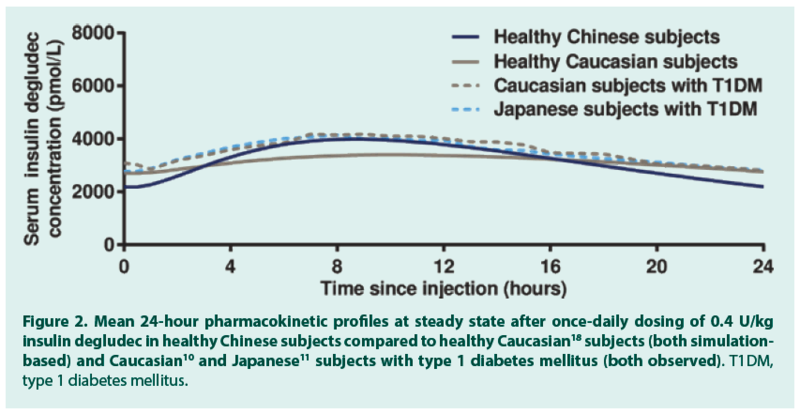 Mean 24-hour pharmacokinetic profiles at steady state after once‑daily dosing of 0.4 U/kg insulin degludec in healthy Chinese subjects compared to healthy Caucasian18 subjects (both simulationbased) and Caucasian10 and Japanese11 subjects with type 1 diabetes mellitus (both observed). T1DM, type 1 diabetes mellitus. Table 2: Enzymatic levels of different groups. A total of 9 adverse events were reported in 4 subjects (all mild). No serious adverse events or confirmed hypoglycemic episodes were reported. No injection site reactions were reported and there were no clinically significant findings among clinical laboratory tests, vital signs, physical examination, or electrocardiogram. This is the first trial to investigate and characterize the pharmacokinetic properties of insulin degludec in Chinese subjects. During the first 24 hours after a single insulin degludec dose in healthy Chinese subjects, the shape and general level of the serum insulin degludec concentration-time profile were comparable to those previously seen in healthy Caucasian subjects . This initial 24-hour period corresponds to the first dosing interval in a oncedaily dosing regimen. Also, total exposure after a single insulin degludec dose was comparable between healthy Chinese subjects, as observed in the present trial, and healthy Caucasian subjects . A somewhat higher maximum concentration after a single dose was observed in healthy Chinese subjects than observed previously in healthy Caucasian subjects . However, it should be emphasized that for insulin degludec, a drug with a half-life of approximately 25 hours, it takes approximately 2-3 days for serum concentrations to build up to the steady-state level . Therefore, the difference between Chinese and Caucasian subjects in maximum concentration after a single insulin degludec dose may only be clinically relevant for the first 24 hours after initiating insulin degludec treatment. Indeed, the difference in maximum insulin degludec concentration diminished at steady state, and exposure in Chinese subjects appeared comparable to that observed in Caucasian and Japanese subjects (TABLE 2 and FIGURE 2) . This is likely due to the fact that at steady state, the serum insulin degludec concentration level is the result of absorption from the last 4-5 days of insulin degludec administration and therefore would be less affected by possible differences in the absorption rate from each individual injection. A major fraction of insulin degludec in the circulation is bound to albumin and a smaller fraction is free. The specific insulin degludec assay measures both the free and bound insulin degludec and therefore the insulin concentrations are higher compared to insulins not bound to albumin. However, as insulin degludec has the same total glucose-lowering effect as human insulin and insulin glargine 100 U/mL this would suggest that all insulin degludec molecules in the circulation will eventually bind to the insulin receptor and lead to action [8,10]. Because of the long half-life of insulin degludec, it would be considered most relevant to assess its pharmacokinetic properties in a steady-state setting after several days of once-daily dosing, as described above. However, since healthy Chinese subjects were included in the present trial, it was not considered possible to conduct such a trial with multiple clinically relevant doses due to risk of hypoglycemia. In the current trial, therefore, observed single-dose data were utilized in order to simulate the steady-state pharmacokinetic profile of insulin degludec in healthy Chinese subjects. In the simulation, it was shown that insulin degludec exposure under steady-state conditions was distributed relatively evenly over a 24-hour dosing interval and the simulated insulin degludec pharmacokinetic profiles in healthy Chinese subjects were comparable to those previously acquired by simulation in healthy Caucasian subjects and those observed in Caucasian and Japanese subjects with T1DM [10,11,19]. Similar steady-state pharmacokinetic profiles of insulin degludec have also been shown in African American, Hispanic/Latino and Caucasian subjects with T2DM . Thus, the steady-state pharmacokinetic properties of insulin degludec are preserved across a broad range of racial and ethnic groups. Based on the abovedescribed consistent pharmacokinetic results, it may thus be assumed that the pharmacokinetic characteristics of insulin degludec seen in the current trial in healthy Chinese subjects and in previous trials in Caucasian and Japanese subjects with T1DM would also be expected in Chinese subjects with T1DM or T2DM [10,11,18]. Furthermore, it would be expected that other pharmacological properties of insulin degludec previously observed in Caucasian and Japanese subjects would be preserved in Chinese subjects. These include its prolonged duration of action and lower day-to-day and within-day variability in glucose-lowering effect as compared with insulin glargine at both 100 U/mL and 300 U/mL [14,21]. Altogether, the current results indicate no need for dosing recommendations specifically related to race for insulin degludec in Chinese patients with diabetes. It is, however, important to emphasize the need for adjustment of insulin treatment according to individual patient needs and based on the actual response . The prolonged duration of action of insulin degludec, limited exposure and effect fluctuations over a 24-hour dosing interval, and the low day-to-day and within-day variability in glucose-lowering effects translate into clinical benefits in terms of flexibility in timing of daily dosing and reduced hypoglycemia risk. In global phase 3 clinical trials in subjects with T1DM or T2DM, the dosing of insulin degludec in a flexible regimen with 8-40 hours between daily injections did not compromise glycemic control or increase the risk of hypoglycemia [22,23]. In a meta-analysis of global phase 3a trials, rates of confirmed overall hypoglycemia and confirmed nocturnal hypoglycemia were reduced with insulin degludec compared with insulin glargine at 100 U/mL . Furthermore, insulin degludec was associated with reductions in overall, nocturnal and severe hypoglycemic episodes in crossover SWITCH 1 and SWITCH 2 trials in type 1 and type 2 diabetes compared to insulin glargine 100 U/mL [25,26]. In the DEVOTE cardiovascular outcomes trial, insulin degludec was associated with significant reductions in severe and nocturnal severe hypoglycemic episodes compared to insulin glargine 100 U/ mL . Finally, in Chinese subjects with T2DM, insulin degludec 100 U/mL provided effective glycemic control that was non-inferior to insulin glargine 100 U/mL [28,29], with lower rates of nocturnal hypoglycemia . This trial carried some of the limitations that are often inherent in clinical pharmacology trials: a relatively low number of healthy subjects was included, a single dose of a product intended for multiple dosing was administered and the dose level was fixed, although insulin should be individually titrated in clinical practice. Thus, the highly controlled conditions of the current trial are considered relatively far from clinical practice. Consequently, safety observations in general and hypoglycemia reporting specifically in the current trial are not expected to reflect the clinical setting. Still, it is reassuring that a single dose of insulin degludec was also well tolerated in healthy Chinese subjects, as was also the case in previous single-dose and short-term multipledose clinical pharmacology trials with insulin degludec in Caucasian and Japanese subjects [10,11,19] as well as in large Pan-Asian and global phase 3 trials with longer-term treatment of insulin degludec [25-33]. In summary, steady-state simulation based on observed single dose pharmacokinetic profiles of insulin degludec in healthy Chinese subjects showed that insulin degludec exposure is close to evenly distributed over a 24-hour steady state dosing interval and is comparable to exposures previously observed in healthy Caucasian subjects and in Caucasian and Japanese subjects with T1DM. It is concluded that the pharmacokinetic properties of insulin degludec in Chinese subjects are consistent with those observed in Caucasian and Japanese subjects and there appears to be no need for racespecific dose adjustment in Chinese people. Medical writing support was provided by Carsten Roepstorff and Angela Stocks, Larix A/S, Copenhagen, Denmark funded by Novo Nordisk. HLH and LB are employees and shareholders of Novo Nordisk. PH and JJ have no conflicts of interest to declare. HLH contributed to the conception and design of the trial, and HLH and LB contributed to the data acquisition and data analysis. All authors contributed to the interpretation of the data. All authors significantly contributed to the preparation of the manuscript, are in agreement with the content of the manuscript, have approved the final version, and agree to be accountable for all aspects of the work. International Diabetes Foundation. Diabetes Atlas 7th edition, 2015. http://www.idf.org/diabetesatlas. Wang L, Gao P, Mei Zhang M et al. Prevalence and ethnic pattern of diabetes and prediabetes in China in 2013. JAMA. 317 (24), 2515-2523 (2017). Inzucchi S, Bergenstal R, Buse J et al. Management of hyperglycaemia in type 2 diabetes, 2015: a patient-centred approach. Update to a position statement of the American Diabetes Association and the European Association for the Study of Diabetes. Diabetologia. 58(1), 429-442 (2015). Heise T, Pieber T. Towards peakless, reproducible and long-acting insulins. An assessment of the basal analogues based on isoglycaemic clamp studies. Diabetes. Obes. Metab. 9(5), 648-659 (2007). Heise T, Korsatko S, Nosek L et al. Steady state is reached within 2-3 days of once-daily administration of degludec, a basal insulin with an ultralong duration of action. J. Diabetes. 8(1), 132-138 (2016). Vora J, Cariou B, Evans M et al. Clinical use of insulin degludec. Diabetes. Res. Clin. Pract. 109(1), 19-31 (2015). Haahr H, Heise T. A review of the pharmacological properties of insulin degludec and their clinical relevance. Clin. Pharmacokinet 53(9), 787-800 (2014). Jonassen I, Havelund S, Hoeg-Jensen T et al. Design of the novel protraction mechanism of insulin degludec, an ultra-long-acting basal insulin. Pharm. Res. 29(8), 2104-2114 (2012). Kurtzhals P, Heise T, Strauss H et al. Multi-hexamer formation is the underlying basis for the ultra-long glucose-lowering effect of insulin degludec. Diabetologia. 54, S426 (2011). Heise T, Hovelmann U, Nosek L et al. Comparison of the pharmacokinetic and pharmacodynamic profiles of insulin degludec and insulin glargine. Expert. Opin. Drug. Metab. Toxicol. 11(8), 1193-1201 (2015). Ikushima I, Kaku K, Hirao K et al. Pharmacokinetic and pharmacodynamic properties of insulin degludec in Japanese patients with type 1 diabetes mellitus reflect similarities with Caucasian patients. J. Diabetes. Investig 7 (2) 270-275 (2016). Heise T, Nosek L, Bottcher SG et al. Ultra-long-acting insulin degludec has a flat and stable glucose-lowering effect in type 2 diabetes. Diabetes. Obes. Metab. 14(10), 944-950 (2012). Heise T, Hermanski L, Nosek L et al. Insulin degludec: four times lower pharmacodynamic variability than insulin glargine under steady-state conditions in type 1 diabetes. Diabetes. Obes. Metab. 14 859-864 (2012). Heise T, Norskov M, Nosek L et al. Insulin degludec: Lower day-to-day and within-day variability in pharmacodynamic response compared with insulin glargine 300 U/mL in type 1 diabetes. Diabetes. Obes. Metab. 19(7), 1032-1039 (2017). Chen M. Ethnic or racial differences revisited: impact of dosage regimen and dosage form on pharmacokinetics and pharmacodynamics. Clin. Pharmacokinet. 45(10), 957-964 (2006). Morello C. Pharmacokinetics and pharmacodynamics of insulin analogs in special populations with type 2 diabetes mellitus. Int. J. Gen. Med. 4, 827-835 (2011). World Medical Association. Declaration of Helsinki. Ethical Principles for Medical Research Involving Human Subjects. Last amended by the 59th WMA General Assembly, Seoul, October 2008. American Diabetes Association. Defining and reporting hypoglycaemia in diabetes: a report from the American Diabetes Association Workgroup on Hypoglycaemia. Diabetes. Care. 28(5), 1245-1249 (2005). Nosek L, Coester H, Roepstorff C et al. Glucose-lowering effect of insulin degludec is independent of subcutaneous injection region. Clin Drug Investig 34(9), 673-679 (2014). Hompesch M, Morrow L, Watkins E et al. Pharmacokinetic and pharmacodynamic responses of insulin degludec in African American, white, and Hispanic/Latino patients with type 2 diabetes mellitus. Clin. Ther. 36(4), 507-515 (2014). Heise T, Kaplan K, Haahr H. Day-to-day and within-day variability in glucose-lowering effect between insulin degludec and insulin glargine (100 U/mL and 300 U/mL): A comparison across studies. J. Diabetes. Sci. Technol 12(2), 356-363 (2018). Mathieu C, Hollander P, Miranda-Palma B et al. Efficacy and safety of insulin degludec in a flexible dosing regimen vs insulin glargine in patients with type 1 diabetes (BEGIN: Flex T1): a 26-week randomized, treat-to-target trial with a 26-week extension. J. Clin. Endocrinol. Metab. 98(3), 1154-1162 (2013). Meneghini L, Atkin S, Gough S et al. The efficacy and safety of insulin degludec given in variable once-daily dosing intervals compared with insulin glargine and insulin degludec dosed at the same time daily: a 26-week, randomized, open-label, parallel-group, treat-to-target trial in individuals with type 2 diabetes. Diabetes Care 36(4),858-864 (2013). Ratner RE, Gough S, Mathieu C et al. Hypoglycaemia risk with insulin degludec compared with insulin glargine in type 2 and type 1 diabetes: a pre-planned meta-analysis of phase 3 trials. Diabetes. Obes. Metab. 15(2), 175-184 (2013). Lane W, Bailey, T, Gerety G et al. Effect of insulin degludec vs insulin glargine U100 on hypoglycemia in patients with type 1 diabetes. JAMA. 318(1), 33-44 (2017). Wysham C, Bhargava A, Chaykin L et al. Effect of insulin degludec vs insulin glargine U100 on hypoglycemia in patients with type 2 diabetes. JAMA 318(1), 45-56 (2017). Marso S, McGuire D, Zinman B et al. Efficacy and safety of degludec versus glargine in type 2 diabetes. N. Engl. J. Med. 377(8), 723-732 (2017). Pan C, Gross J, Yang W et al. A multinational, randomized, open-label, treat-to-target trial comparing insulin degludec and insulin glargine in insulin-naïve patients with type 2 diabetes mellitus. Drugs. RD. 16(2), 239-249 (2016). Mu Y, Guo L, Li L et al. The efficacy and safety of insulin degludec versus insulin glargine in insulin-naive subjects with type 2 diabetes: results of a Chinese cohort from a multinational randomized controlled trial. Zhonghua. Nei. Ke. Za. Zhi. 56(9), 660-666 (2017). Onishi Y, Iwamoto Y, Yoo S et al. Insulin degludec compared with insulin glargine in insulin-naïve patients with type 2 diabetes: A 26-week, randomized, controlled, Pan-Asian, treat-to-target trial. J. Diabetes. Investig. 4(6), 605-612 (2013). Heller S, Buse J, Fisher M et al. Insulin degludec, an ultra-long acting basal insulin, versus insulin glargine in basal-bolus treatment with mealtime insulin aspart in type 1 diabetes (BEGIN Basal-Bolus Type 1): a phase 3, randomised, open-label, treat-to-target non-inferiority trial. Lancet. 379(9825), 1489-1497 (2012). Garber A, King A, Del Prato S et al. Insulin degludec, an ultra-longacting basal insulin, versus insulin glargine in basal-bolus treatment with mealtime insulin aspart in type 2 diabetes (BEGIN Basal-Bolus Type 2): a phase 3, randomised, open-label, treat-to-target non-inferiority trial. Lancet 379(9825), 1498-1507 (2012). Zinman B, Philis-Tsimikas A, Cariou B et al. Trial Investigators. Insulin degludec versus insulin glargine in insulin-naive patients with type 2 diabetes: a 1-year, randomized, treat-to-target trial (BEGIN Once Long). Diabetes. Care .35(12), 2464-2471 (2012).